Product prices and availability are accurate as of 2019-04-19 21:21:37 UTC and are subject to change. Any price and availability information displayed on http://www.amazon.co.uk/ at the time of purchase will apply to the purchase of this product. 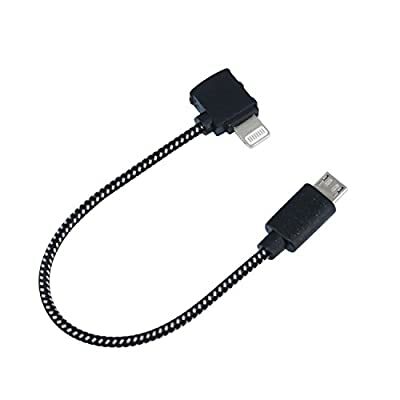 Nylon braided lightning cable / Android Micro-USB/ USB Type C cable for DJI Spark and Mavic Pro drone. Perfect Length: 5.9 inches (15 cm) cable for Smart Phone, 11.4 inches (29 cm) cable for Tablet PC. Color: black. All cables compatible for DJI Spark drone and DJI Mavic Pro drone's remote controller. [ Will fits Spark Drone's controller better.] Note: For Apple device users, if it shows "accessory not compatible", Please Disable your device WIFI, connect the cable and go into the "DJI GO4" app and you will be connected to the RC successfully. 6-month warranty, FREE NEW CABLE if product not working or damaged during warranty period.